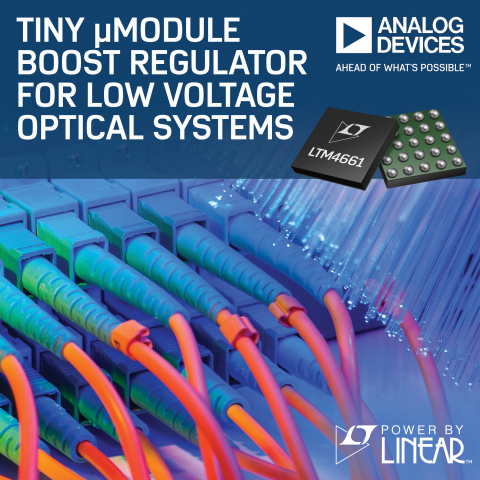 NORWOOD, Mass.--(BUSINESS WIRE)--Analog Devices, Inc. today announced the Power by Linear™ LTM4661, a low power step-up µModule® regulator in a 6.25mm x 6.25mm x 2.42mm BGA package. Only a few capacitors and one resistor are required to complete the design, and the solution occupies less than 1cm² single-sided or 0.5cm² on double-sided PCBs. The LTM4661 incorporates a switching DC/DC controller, MOSFETs, inductors and supporting components. The LTM4661 operates from a 1.8V to 5.5V input supply, and continues to operate down to 0.7V after start-up. The output voltage can be set by a single resistor ranging from 2.5V to 15V. The combination of the small, thin package and wide input and output voltage range is ideal for wide range of applications including optical modules, battery-powered equipment, battery-based backup systems, bias voltage for power amps or laser diodes and small DC motors. The LTM4661 can deliver 4A continuously under 3.3VIN to 5VOUT, and 0.7A continuously under 3.3VIN to 12VOUT. The LTM4661 employs synchronous rectification, which delivers as high as 92% conversion efficiency (3.3VIN to 5VOUT). The switching frequency is 1MHz, and can also be synchronized to an external clock ranging from 500kHz to 1.5MHz. The LTM4661 1MHz switching frequency and dual phase single output architecture enable fast transient response to line and load changes and a significant reduction of output ripple voltage. The LTM4661 has three operation modes: Burst Mode® operation, forced continuous mode and external sync mode. The quiescent current in Burst Mode operation is only 25µA, which provides extended battery run time. For applications demanding the lowest possible noise operation, the forced continuous mode or external sync mode minimize possible interference of switching noise. The LTM4661 operates from –40℃ to 125℃ operating temperature. For more information, visit http://www.analog.com/LTM4661. Analog Devices’ Tiny µModule Boost Regulator for Low Voltage Optical Systems.